This week on A Lab Aloft, International Space Station Program Science Office Research Communications Specialist Jessica Nimon shares answers to some of the more frequently asked questions she receives about the International Space Station. Recently I attended two different public forums as a representative for the International Space Station Program Scientist’s Office. It was an exciting opportunity to share information about the station with the public and to get some feedback in return. 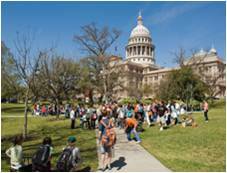 The first event, Space Day on the Capitol in Austin, Texas, was a chance to speak with state legislators, visiting students and even tourists. A week later, I went to Colorado Springs for the National Space Symposium, which was more of a traditional conference setting for space businesses and enthusiasts. My main objective at these events was to educate and answer questions regarding the research done on the space station. I anticipated a varied set of queries, but was surprised to find that when it came down to it, attendees at both events had similar misconceptions regarding the station. So in this blog, I hope to take a few moments of your time to correct the three most frequent misunderstandings regarding this amazing orbiting laboratory. While the public seems well aware of the impending retirement of the space shuttle fleet, they are mixed in their understanding of what this means for the space station. Quite a few people asked me, “Does the space station retire with the shuttle?” In a word, no. The international partner agreements plan to continue to operate the space station through the year 2020. Now that we are finally at assembly complete, the entire International Space Station program is ready for full utilization for research and technology investigations! While we may not arrive there via the space shuttle any longer, we continue to have crew travel capabilities with the Russian Soyuz. In fact, American astronauts have successfully and safely flown with the Russians on Soyuz for many years. American companies are also pursuing new crew vehicle options to offer transportation to the space station in the future. The question of upmass—the capability to lift large amounts of payload and supply weight—will continue to be addressed with international partner unmanned transport vehicles: JAXA HTV and ESA ATV, as well as two new American commercial resupply vehicles: Space X Dragon and Orbital Cygnus. One of my favorite questions to pose to the student groups that would visit the NASA booth at the National Space Symposium was “what is the space station used for?” Sometimes a shy hand would raise and a boy or girl would offer that the station was built for research. More often than not, however, I was met with complete silence and a sea of blinking eyes. What an opportunity to educate these young minds on the fascinating purpose of the station! 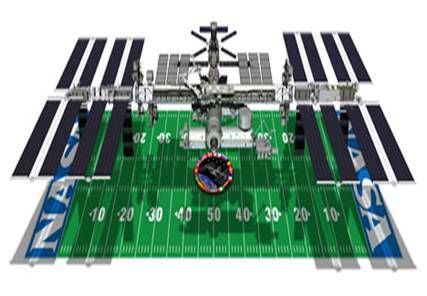 Pointing to the scale model—which was to 1/100 the size of the space station, situated above a mini football field to illustrate the actual size—my colleagues and I took turns explaining. From the very beginning, the point of this unique facility was to perform experiments in the microgravity environment of low Earth orbit. It is interesting to note that investigations were conducted during the course of assembly, as well. Because the research did not have to wait for station completion, we are already seeing results from the early studies in space, which is remarkable! Not only can scientists use the space station for short- and long-duration investigations, but they can also participate in the growing body of knowledge generated from their predecessors. Space station research has been published in prestigious science journals and continues to generate spinoff benefits. This information stands to serve people across the globe. When investigations yield results, they have the potential to cross all boundaries—gender, race, socioeconomic, etc. Reading this blog and the space station research and technology Web pages are a great way to keep up with emerging benefits. While I was at the National Space Symposium, there was a space station sighting opportunity for the Colorado Springs area. I shared this viewing prospect with visitors at the NASA exhibit. Some were amazed that they could go out onto their lawn, gaze at the sky, and see what appears to be a bright, fast-moving star and really be looking at an international orbiting laboratory. It was fun to remind people that while they stare up, the crew may be looking down, too. This idea of humans in orbit provides the chance to share an important milestone reached in November of 2010—the space station now has a track record of over a decade of continued human presence in orbit! With the impending shuttle retirement, however, some fear that the days of Americans in space are numbered. Since crewmembers will fly via the Russian Soyuz, there is a misapprehension that only Russians will get to view back at Earth from the station in the future. The population of the space station, however, will remain as international as the collaboration that built it. Not only will we still have an American presence in space, but we will continue to have participants from all over the world. Currently we have two Americans, three Russians, and a European crewmember working in orbit. during rendezvous and docking activities of space shuttle Discovery (STS-133). The international investment has already been made in the space station. Now is the time to not only continue use, but to ramp up our employment of this unique resource. Scientists have the upcoming decade to ask questions and send up investigations to make the most of the asset we have in this incredible laboratory. Jessica Nimon worked in the aerospace industry as a technical writer for seven years before joining the International Space Station Program Science Office as the Research Communications Specialist. Jessica composes Web features, blog entries, and manages the @ISS_Research Twitter feed to share space station research and technology news with the public. She has a master’s degree in English from the University of Dallas. To make the case that the ISS is not just an achievement of engineering (and international politics) but also a useful scientific laboratory, you must provide its so called “impact”, i.e. the rate by which science papers based on ISS research get quoted in the scientific literature in general – this is still the most telling ‘metric’ of any scientific venture. And then compare this impact (perhaps even the impact per dollar invested …) with other – unmanned – space projects, experiments in sounding rockets, on parabolic flights, using drop towers etc. I’ve tried in vain to get any numbers on the scientific impact of the ISS from ESA and others (including a USA Today science writer I recently talked to) have failed to get them from NASA – perhaps I’m lucky here …? Sounding rockets, drop towers and aircraft that fly a parabolic path are methods of creating microgravity conditions on Earth, but they only provide a few seconds or minutes of this environment. On the other hand, the permanent presence of the International Space Station in a microgravity environment allows researchers to rapidly acquire the large sets of data necessary to validate new concepts. They can also make multiple experiment runs in succession, obtaining statistically significant results in a matter of weeks, even days, instead of years. During construction, the station crew conducted research investigations and completed ~20 percent of the anticipated research expected for the lifetime of the laboratory. Now at assembly complete, the station is transitioning to full utilization and is slated to operate through 2020. This is where the remaining 80 percent of research will occur. Research conducted thus far on the station has already yielded significant accomplishments, such as improved cancer treatment delivery and microbial vaccine development. Results such as these can have major positive impacts to quality of life here on Earth. You can read about these benefits and more at: https://www.nasa.gov/mission_pages/station/research/coolstation.html.